In his electrifying first novel Joe Buff instantly established himself as the ultimate chronicler of 21st-century warfare by taking military fiction and submarine combat to a new level of authenticity, vision, and power. Thunder in the Deep picks up where Deep Sound Channel left off, bringing to life a frightening seascape where technology pushes warriors to new extremes, and warriors push technology to the max. This time the difference between victory and defeat hinges on the two most advanced nuclear attack submarines in the world. The Challenger is the weapon of the future, a ceramic-hulled nuclear attack submarine whose electronic eyes and ears are the most advanced ever created. It is commanded by acting captain Jeffrey Fuller, a former SEAL turned submariner whose aggressiveness has made him a rising star — and sometimes scares the hell out of his crew. Fuller’s mission is to rescue the Virginia-class fast attack sub Texas, now lying on the bottom of the Atlantic just off the Azores. But the enemy — a newly resurrected and fanatically militaristic Germany — knows where the Texas is, too, and knows the Challenger is coming. It is Challenger the Germans want, dispatching their own high-tech supersub, the Deutschland, to destroy her. In this war your enemy is a blip on a console hardwired into an integrated nuclear weapons system. Ships are vaporized off the surface of the sea, nuclear shock waves unleash deadly tsunami waves, and smart submarines do battle with smart aircraft sent to hunt them down. For Jeffrey Fuller and the Challenger, for the men on board the Deutschland, the race beneath the ocean’s surface across a horrific underwater war zone will demand every bit of courage and skill they can muster just to survive. Before it’s over, the Challenger’s mission is radically redefined: Fuller, his SEALs, and freedom fighter Ilse Reebeck are sent into Germany itself — to plant a nuke right in the gut of the enemy’s power structure. 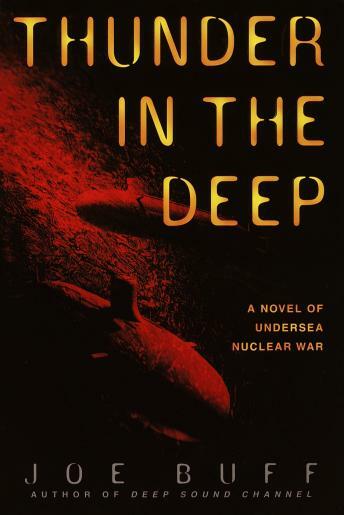 Thunder in the Deep plunges the reader into the middle of some of the fiercest and most thrilling depictions of underwater warfare ever written. It is an electrifying novel of military strategy and action, a powerful tale of technology and humanity that will have you breathlessly turning pages until the explosive climax.